At Caroline’s, playtime is always high on our list of priorities. If there is one thing we know, most pets can’t get enough of, it is the chance to romp, roll, run and play with new friends. At Caroline’s Pampered Pet Motel, your dog will get plenty of opportunities to do just that. We consider playtime a priority, and will be sure to give your pet more playtime than he or she could ever imagine. Our indoor and outdoor play areas provide endless chances for your loved one to run, jump, chew and scratch. With so many chances to have fun, you will also feel good knowing your pet is being carefully watched over by our staff at all times. Pets enjoy a massive heated and air-conditioned indoor play area. We also offer a covered outdoor play area for playtime on beautiful days. Our playtime lasts all day. To be precise, that’s 14.5 hours-worth of play for your pet. There is no need to worry about your pet’s safety. Our highly trained staff is always in the play area with our guests to give them love, attention and all the fun they can enjoy. Your pet’s well-being is always the top priority at Caroline’s. All of the fencing for our playtime areas is secure from top to bottom. Even the most determined dogs can’t dig their way out and no skillful climbers can escape over the top. Unsocial dog? No need to fret. Your pet will always get the same level of attention from us and an equal amount of playtime in our play area. He or she just won’t join our play. 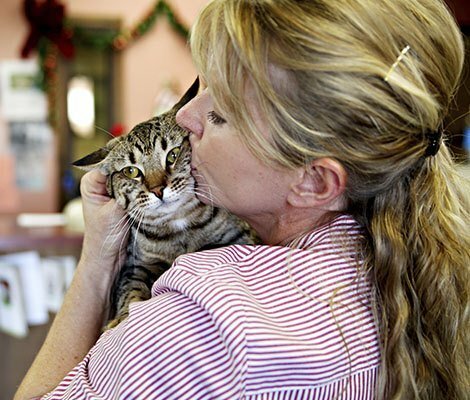 Pets must be spayed or neutered to participate in group playtime (unless 6 months or younger). Perfect Turf® Pet Grass is soft and easy on the feet, stays cleaner than concrete, and lets our guests play on a grass-type surface instead of a hard floor. We offer only the best during playtime for your pet. Cats can enjoy playtime too! Dogs aren’t the only ones that can enjoy playtime! At Caroline’s Pampered Pet Motel, cats receive individual playtime and are allowed to roam their room for exercise as well. We know how important playtime is for pets, and would never allow them to receive inadequate exercise while under our care. This is why we have created such a safe and spacious play area for all of our guests to enjoy. 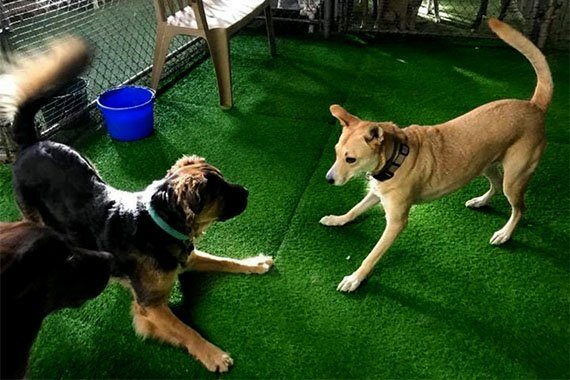 Whether your pet is running and jumping with newfound friends or playing with our friendly staff, playtime at Caroline’s Pampered Pet Motel is a treat for everyone involved. We also recognize the effect playtime with others can have on pets. For that reason, we are able and willing to give your pet a bath when playtime is over. For a modest charge, we will be sure your furry friend is clean, fresh and looking good for the ride home.